I want them to always show "kg" after the value that is entered. Any decimal value entered need to be rounded up to 2 decimal places; if there are no decimal places, it's going to show the whole number. 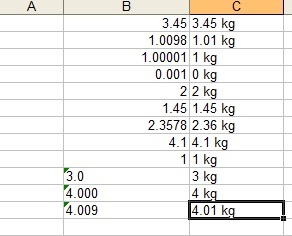 I've formatted cells to 0" kg"so it always show the kilograms. As for showing only decimals if necessary, I've used the formula =ROUND(X, 2) on each cell to only show two decimals (X being the value I introduce). Question: However when I type =ROUND(2.5, 2) it displays 3 kg instead of 2.5 kg. Why is it? Do you have other possible solutions? 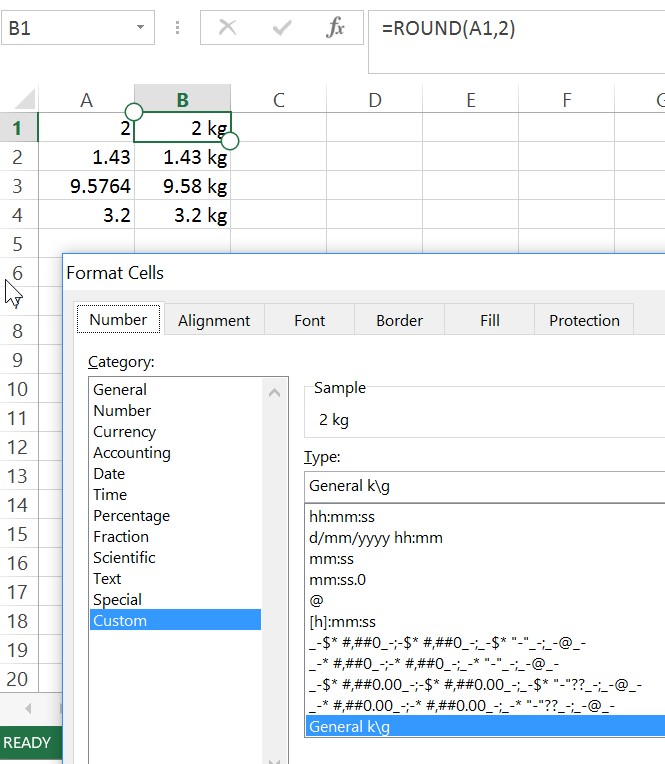 I've changed the cell formatting to 0.##" kg" and it works just like I want. Now the problem is if I use =ROUND(10, 2) it displays 10. kg with that additional point right after the number. One possible solution based on what I understand your requirement. Use FIXED function to first round it to 2 decimals and check for last three digits, if .00 use only integer portion and concatenate with 'kg' if last digit is zero round to only 1 decimal else round to two decimals. How do I show formatted numbers only in the formatted form in Excel cells? in Excel I want trailing 0's on a rounded value that ends up in a text formatted cell, how can I do that?